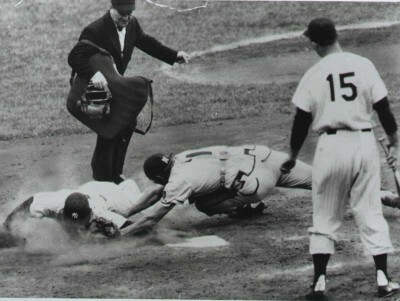 The 1957 World Series featured the defending champions, the New York Yankees (American League), playing against the Milwaukee Braves (National League). After finishing just one game behind the N.L. Champion Brooklyn Dodgers in 1956, the Braves came back in 1957 to win their first pennant since moving from Boston in 1953. The Braves won the Series in seven games, behind Lew Burdette's three complete game victories, and became the first team to win a championship after relocating. The Yankees had home field advantage in the series. Games 1, 2, 6, and 7 were played at Yankee Stadium, while Milwaukee County Stadium hosted Games 3, 4, and 5. This was the first time since 1946 that the Series included scheduled off days after Games 2 and 5. Of the previous ten World Series, the Yankees had participated in eight of them and won seven. As predicted (and as usual) the New York Yankees continued to dominate the American League on their way to their twenty-second Fall Classic with what seemed like a never-ending line-up of superstars. Manager Casey Stengel had already become the most successful skipper in postseason history and many fans were beginning to wonder if "The Curse of the Bambino" had rubbed off on the rest of the American League. Their counterpart was an up-and-coming franchise that lacked the familiar line-up card, but equally dominated the National League on the way to their third pennant. The Milwaukee Braves were a definite contender and featured a "big gun" outfielder named Henry Aaron. "Hank" as he was called, tallied forty-four home runs, one-hundred thirty-two runs batted in and batted .322 in only his fourth season. He was backed up by third baseman Eddie Mathews who knocked out thirty-two home runs of his own and outfielder Wes Covington who added twenty-one in ninety-six games. Defensively the Braves were stacked with Del Crandall behind the plate, Johnny Logan and Red Schoendienst serving as the keystone combination and Billy Bruton in centerfield. Burton was eventually replaced after a knee injury by Bob Hazle who batted a phenomenal .403 in forty-one games. On the mound, Milwaukee's rotation boasted fifty-six wins from Warren Spahn (who had twenty wins for the eighth season), Bob Buhl and Lew Burdette. The National League champs were a well-balanced team indeed and a perfect candidate to match up with the perennial champion Yankees. Game 1 opened in New York with Series veteran Whitey Ford tossing a five-hitter that ended as a 3-1 victory, but the Braves answered back the next day with a Burdette 4-2 win. Game 3 moved the Series to Milwaukee and an unwanted "hometown hero" named Tony Kubek made a triumphant return. The twenty year-old rookie, who doubled as both a utility outfielder and infielder, nailed two homeruns for the Yanks on the way to an embarrassing 12-3 thrashing of the home team. Spahn was determined to retrieve the respect the Braves had lost in their own house and carried a 4-1 lead in Game 4 going into the ninth. After retiring the first two batters and holding a 3-2 count on Elston Howard, the Milwaukee ace blinked and surrendered a game-tying home run into the left-field stands. Then, in the top of the tenth, Hank Bauer tripled home Kubek, and the Yankees, (who were one strike away from defeat), pulled ahead, 5-4. Nippy Jones led off for the Braves as a pinch-hitter for Spahn. Umpire Augie Donatelli called Tommy Byrne's first pitch a ball, but the thirty-two year-old reserve infielder argued that he had been struck on the foot. In an effort to prove his point, Jones retrieved the baseball, showed Donatelli a smudge of shoe polish on it and was awarded his base. Felix Mantilla was sent in to run for Jones and scored on a Johnny Logan double off of Bob Grim. With the game tied, 5-5, Eddie Mathews put his team over the top by belting a home run to right for the 7-5 comeback. The Braves entered Game 5 with a renewed vigor and a controversial pitcher who had evened the score in Game 2. Lew Burdette had been criticized throughout his career for using the "spitball" technique and many fans had suspected that the right-hander had prospered (eighty-five wins over six seasons) by practicing the illegal toss. Despite the mounting questions, Burdette bested Whitey Ford for another clutch 1-0 performance. The Yankees Gil McDougald almost changed the outcome with a leadoff drive to deep left-field, but Wes Covington saved the day with a wall jumping grab. Milwaukee then scored the game's only run in the sixth. After two were out, Mathews, Aaron and Joe Adcock all singled. For Adcock, the timely hit was well overdue after a long frustrating year at the plate. After slugging thirty-eight home runs in '56, he had managed a meager twelve homers in sixty-five games. Game 6 remained anyone's for seven innings until Hank Bauer launched a rocket off of Braves reliever Ernie Johnson, who otherwise pitched brilliantly in a 4 1/3-inning effort. Milwaukee made it interesting with a 2-2 tie in the top of the inning on a bases-empty homer by Aaron. Earlier, Yogi Berra had belted a two-run shot for the Yanks and Frank Torre had connected for the Braves. Besides surrendering the two homers, Yankees right-hander Bob Turley allowed only two other hits. In a bizarre twist, one year and two days after his perfect Game 5 against Brooklyn, Don Larsen had another chance to be a hero in Game 7. Unfortunately, in a rare instance for the Yankees, history did not repeat itself and the young righty didn't even make it through the third-inning. After Mathews tagged him for a two-run double, Larsen allowed the Braves to score four times. Del Crandall tacked on another run in the eighth giving Burdette his second shutout and a World Championship title. In the end, the questioned pitcher had not only clinched the Series for Milwaukee, he had done so with three complete-game victories (with or without his "spitball"). Aaron had remained the Braves top standout throughout the postseason with three home runs, seven runs batted in and a spectacular .393 average. Although the Yankees had continued to add American League pennants to their collection, they had now lost two out of three World Series and both teams would find themselves in a classic rematch the following year.